Ford's chief executive this week acted to dampen expectations about what its first self-driving cars will offer, reports Bloomberg, saying that the company had "overestimated" the arrival of autonomous vehicles. However, despite cautioning that its first self-driving car in 2021 would offer a narrow range of applications, CEO Jim Hackett said that the vehicles will ultimately change the world. The EU commissioner for transport, Violeta Bulc, expects vehicles to have full self-driving capability by 2030, according to comments she made to a recent conference in Slovenia, reports John Koetsier at Forbes. "By 2030 we believe we will have the new generation of vehicles that will be fully automated," said Bulc, pointing out that manufacturers had added 15 new safety and automation features this year. Eager to reach new customers? Our autonomous and connected vehicles industry directory helps you to reach new customers, promote your brand and connect with potential business partners. If you're not already listed, be sure to sign up today. Much of the early testing of autonomous vehicle technologies has taken place in arid climates, such as Arizona, where Waymo operates its self-driving taxi fleet. But in Singapore, where tropical downpours and flash flooding are the order of the day, a test centre's rain and flood simulators are about to be put to use, reports IEEE Spectrum, as companies such as nuTonomy begin adverse weather testing of their autonomous vehicles. The Financial Times reports that a European Parliament proposal for self-driving cars to communicate with each other using a WiFi-based system has hit a roadblock, after critics argued for a technology-neutral approach that would leave the door open for 5G technology. The news follows a recent warning from the GSMA, the global body for mobile operators, that the European Commission's choice of technology risked undercutting its own 5G Action Plan. Telecommunications provider O2 has announced that its 5G network will be used to support the testing and development of connected and autonomous vehicle technology at the UK’s Millbrook Proving Ground. The company will enable 5G connectivity to Millbrook testing facilities from June, ahead of the first phase of its 5G rollout in several UK cities later this year. Hyundai and Tencent to develop self-driving car software? South Korean carmaker Hyundai and Chinese tech firm Tencent Holdings have reportedly signed a preliminary deal to develop software for driverless vehicles, according to a Reuters article citing South Korea's Maeil Business Newspaper. According to the report, the companies plan to conduct joint R&D on safety and security systems for self-driving cars. Automotive alliance partners Renault and Nissan have announced a new research and development joint venture in Shanghai that will focus on autonomous drive, connected vehicles and electric vehicles. The carmakers hope that the new facility, Alliance Innovation Lab Shanghai, will support the alliance's plan to launch 12 new electric vehicles and introduce 40 more with different levels of autonomy by 2022. A Cambridge-based company, Wayve.ai, is taking an end-to-end machine learning approach to building a self-driving car, reports Forbes, helping the vehicle to learn to drive like a human in new environments. The firm's unique approach means it can forego expensive LiDAR and data-intensive HD maps, and rely solely on cameras and a typical sat nav system, according to Forbes. CoinDesk reports that General Motors and BMW are backing blockchain technology as a way of sharing self-driving car data, as part of a bid to unlock data from silos that will help get autonomous vehicles on the road sooner. According to CoinDesk, GM filed a patent detailing a system for the use of blockchain to share self-driving car data last year. "Gaming will likely become a critical part of how automakers differentiate their in-car entertainment offerings," reports Business Insider in an article suggesting that as automated vehicles become more widespread, passengers will be freed up to consume more media and content while on the move. At the same time, reports MarketWatch, "Dashboard display, and its revenue-generating ads and services, will compete for driver attention as much as phones do now." 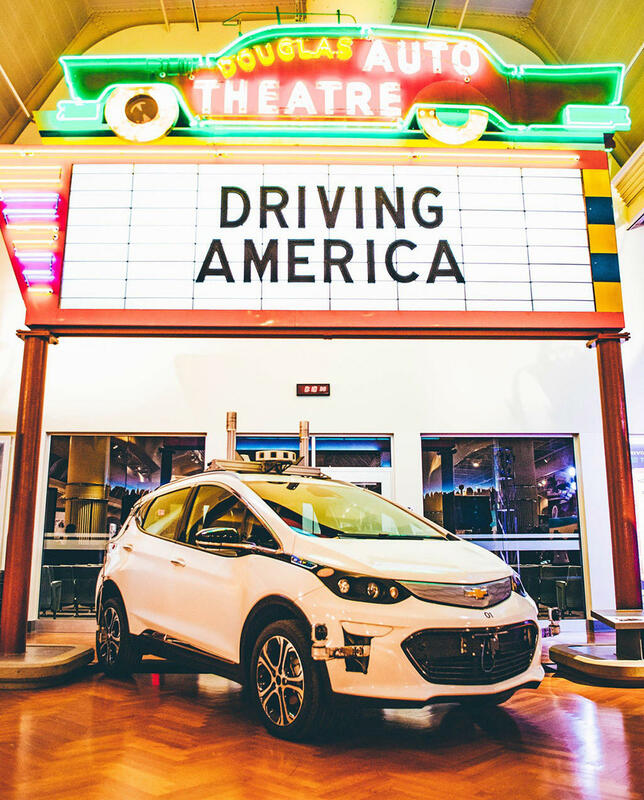 It might seem like it's early days in the story of self-driving cars, but one vehicle has already been consigned to the history books, after General Motors donated one of its first publicly driven self-driving vehicles – a modified pre-production Chevrolet Bolt EV – to The Henry Ford Museum of American Innovation in Dearborn, Michigan. “The Henry Ford is a treasured institution where past and present innovations are documented and displayed, and GM is proud to provide our autonomous test vehicle to serve as an inspiration to the innovators of tomorrow,” said General Motors President Mark Reuss. The vehicle probably won't be the last example of a self-driving car being saved for posterity. So we'd love to know – what autonomous vehicle or technology would you like to see saved for future generations? Let us know here.